Osteosarcoma is rare in cats. If your kitty is limping without explanation, she needs to visit her vet. 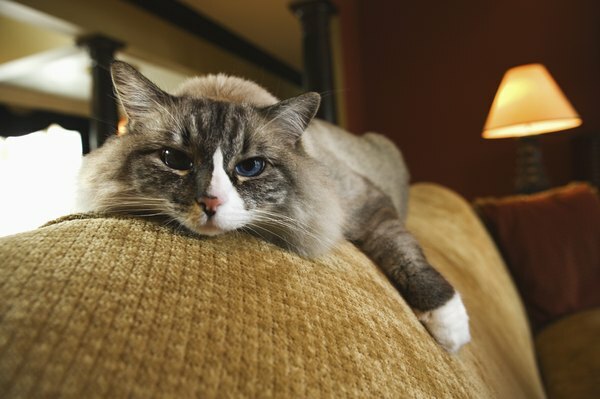 Although there are several innocent reasons for leg pain and limping, these symptoms may mean your favorite feline has bone cancer. Osteosarcoma is a rare malignant bone tumor in cats that requires rapid treatment to prevent spreading. The most common symptom associated with osteosarcoma is intermittent lameness in a limb. There may also be a hard swelling and/or a painful area over one of your kitty's long bones. If the osteosarcoma occurs in a non-weight-bearing bone, such as the skull, it may be difficult to detect. Any lameness without a known cause must be investigated for osteosarcoma. If your vet suspects a bone tumor in your cat, she will take X-rays of the bones and conduct other tests to search for evidence of osteosarcoma or another condition. X-rays of your cat's bones may show the presence of a tumor. And, while most tumors will have metastasized prior to diagnosis, the metastatic lesions are often too small to show up on X-rays, according to VCA Animal Hospitals. For this reason, any cat with a confirmed osteosarcoma is treated as though the tumor has spread to the lungs, the most common location for metastatic osteosarcoma tumors. Because osteosarcoma is highly metastatic, meaning it spreads throughout the body, the prognosis is generally very poor. Additionally, the cancer often causes considerable pain. Treatment involves amputation of the affected limp to reduce pain and prevent further metastasis. Systemic chemotherapy is necessary to treat distant metastasis, whether or not additional tumors are confirmed. Pain relievers and non-steroidal anti-inflammatory medications can ease pain and improve Kitty's quality of life. Both the cancer and the chemotherapy prescribed to treat it can cause pain, sickness, loss of mobility, weight loss and diminished quality of life. To help your cat through this difficult time, offer increased nutritional support to help her maintain a healthy weight and energy level, and make it easier for her to get around by installing ramps over stairs. Offer her a comfortable place to sleep and eat. Most cats who've undergone a single amputation remain mobile, but they may be slower moving around. Be patient with your cat and never hesitate to ask for assistance, stronger pain medication or other help from your vet.